CHARMe: Could it make our job easier? At CEDA, the Centre for Environmental Data Archival, we operate data archives and access services for the environmental research community, particularly for atmospheric and Earth Observation (EO) science. Part of this work includes the helpdesk, where our team handle a wide range of queries from our users; in the last quarter, we received almost 400 queries. The questions we’re asked range from technical matters of broken links, lost passwords to rather in-depth and complex queries about the nature of the datasets we hold. Given that we hold over 300 different datasets including observations from space, aircraft, in situ , models and analyses in a variety of formats and structures, it’s not surprising that some of our users are not sure where to start. I wondered whether the CHARMe system could be useful for our helpdesk staff, as well as our users and data providers, so I have just had a chat with Alison Waterfall, our EO specialist on the helpdesk. Alison estimates we get a couple of queries per week asking which data to use for a particular application, and a similar number asking about issues users have found in the data they’re using. Most of these questions relate to our meteorology and climate in situ observation datasets and it seems that CHARMe might be able to provide answers, if the data producers and helpdesk staff themselves upload relevant comments to the system. In our data catalogue we are lacking any real information about the datasets’ quality, so CHARMe will also help us fill that gap. Helpful Users (HU) sometimes write in to the helpdesk offering us the code they have written to read particular formats. Puzzled Users (PU) write in to the helpdesk asking how to read particular formats. If HU are able to put CHARMe comments into the system with tips and links to their handy code, PU will readily find the tools they need to get started with their netCDF, or ascii data. Similary the helpdesk team themselves could annotate the frequently queried datasets with links to the tools we already make available via the data centres’ websites. So, in summary, my rather incomplete survey, of just one of the helpdesk team, indicates that yes, it will be a pretty useful addition to our current systems and would give us another way to communicate with, and assist our users. In the CHARMe project, we are aiming to improve the amount and quality of information that can be discovered about climate data, to help users decide whether a dataset will meet their needs. There has been a great deal of work done on helping data providers to describe their datasets better, but CHARMe is focusing on a different dimension to the problem – how can users find out knowledge and opinions from other users? We call this user-supplied information “commentary metadata”, or simply “commentary”, and it may be scattered across multiple locations, including databases of publications, technical reports, websites and blogs. However, what if we want to say something about a specific part of a dataset? For example, we might want to highlight an interesting feature, such as a dust storm or volcanic ash cloud, or flag up a potential problem with a processing algorithm or sensor, which may affect all data in a certain geographic region. In the CHARMe project we call this fine-grained commentary. the region in time and space to which the commentary pertains. This may be a four-dimensional regions, including constraints in the horizontal dimensions, the vertical dimension and in time. Having stored this geographic information, how can it be searched efficiently? The integration of GIS techniques and Linked Data is a hot topic of recent discussion and we are participating actively, whilst experimenting with technologies such as Jena Spatial and Strabon. Climate data has many peculiarities; for example, climate models often employ idiosyncratic calendar systems, meaning that we can’t automatically adopt existing standards for recording information such as time. We will be developing this tool over the coming months (building on previous work in projects such as BlogMyData) and working on the above issues. Watch this space for our progress and please contact us if you’d like to discuss further. 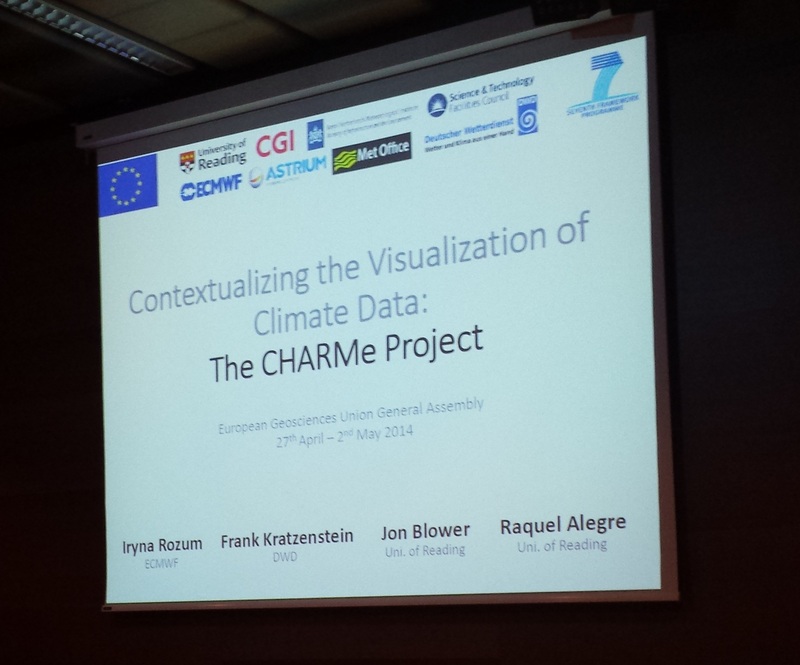 The strap-line for the CHARMe project is “sharing knowledge about climate data” however the linked data model developed in the project is generic and has potential uses well beyond the climate domain. I want to look at just such a situation from my perspective working for Airbus Defence and Space on the application of Earth Observation (EO) data for environmental monitoring. To an extent, environmental monitoring is inextricably bound to the climate sciences as it both encompasses climate observations themselves and many other aspects of the environment are also affected by the climate and how it is changing. So we have reached one important conclusion already – the issues we deal with in the environmental and natural sciences cross disciplines need to be approached in ways that link disparate data, lowering the barriers for information discovery and transfer between different communities and means of communication. But beyond this general point, let’s look at CHARMe’s utility in the context of the launch of a new EO satellite. With the advent of any new EO mission there is an intense period of in-orbit system checks, analysis, calibration, error characterisation and algorithm development. This activity cascades down from well defined systems checklists by engineers to broader disciplines of EO specialists characterising sensor performance, testing and fine tuning the basic radiance products, developing, calibrating and validating atmospheric correction algorithms and geophysical parameter retrievals. Once the higher level products are available, an even broader range of scientists and application developers come into play to utilise the observations and derived geophysical parameters for specialist research and operational services. As a concrete example, consider the Sentinel-2 mission. A core part of the space component of the European Union’s Copernicus programme for global environmental monitoring, the initial two Sentinel-2 satellites will boast super-spectral instruments capable of observing the Earth’s surface at 10 – 20m resolutions, every 5 days. Even as the first satellite was undergoing systems integration at Airbus’s Friedrichshafen facility, EO specialists and domain experts gathered at a Sentinel 2 workshop last month to discuss instrument performance, cross-calibration with other missions, data product development and a range of applications from land cover, phenology, agriculture and forestry to inland water quality, coastal processes and glaciology. The intense preparations, both pre and post launch, is generating a wide range of analysis and development, much of it third party, carried out across the user community to generate commentary on the mission and its derived datasets. This commentary has a high currency and changes rapidly whilst the traditional peer reviewed literature can be months out of date spread out and sometimes difficult to find. And although much information is, in principle, accessible on the Web it is distributed across technical documents, blogs, conference proceedings, on-line results and data. This reduces the efficiency of both knowledge transfer and the ability of different users (EO specialists, domain researchers and application developers) to judge if data are ‘fit-for-purpose’. 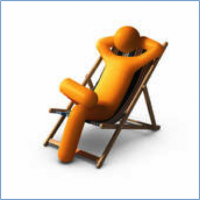 enable the submission and distribution of new commentary information in a timely manner. Thomas Lankester, Airbus Defence and Space. 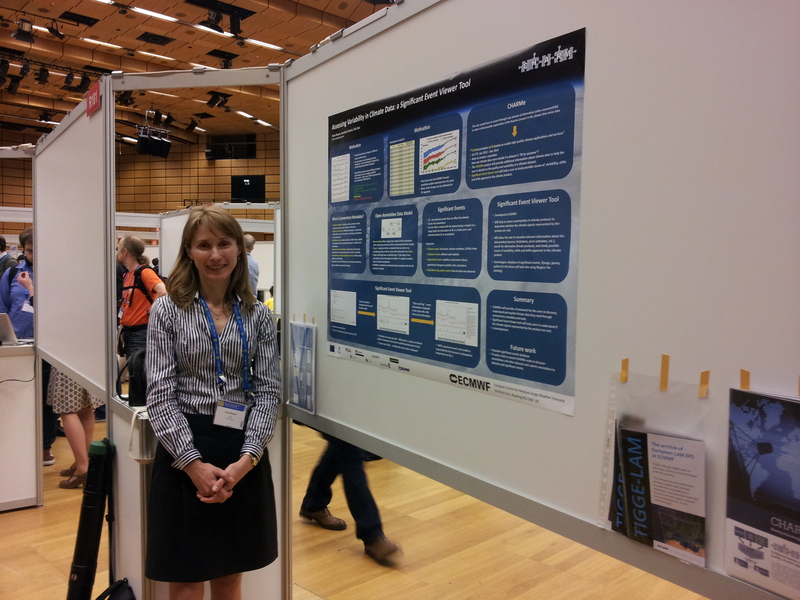 The CHARMe project presented at the EGU meeting in Vienna on 28 March – 2 May 2014. Raquel Alegre delivered a talk on “Contextualizing the Visualization of Climate Data: The CHARMe Project” where the tools developed by the CHARMe consortium were described, and Iryna Rozum presented a poster entitled “Studying variability in climate data: a significant event viewer tool”. Both presentations received lots of questions and initiated discussions on the use of metadata and data models used in climate physics applications, and on the features these tools will provide. These discussions at EGU were very useful in a sense that they provided an insight into what potential CHARMe users want and also gave us extra ideas, for example the use of VO concepts for significant events, that we are looking into whether they are applicable to CHARMe. One aspect was clear: scientists are looking forward to using CHARMe tools! One of the goals of the CHARMe project is to broaden research partnerships by building strategic links with other parties outside Europe. 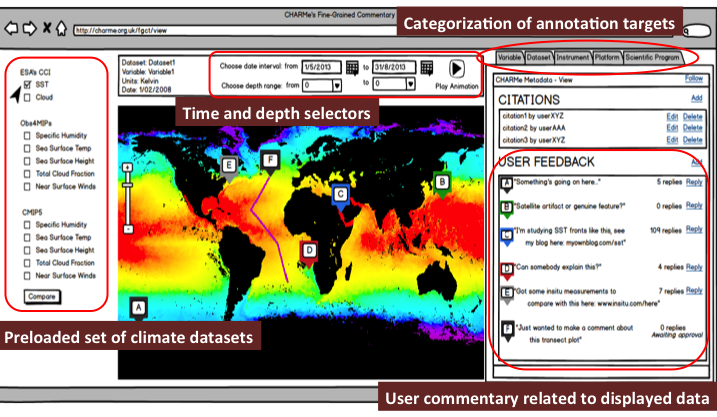 Since the beginning of the project, the CHARMe project found the US National Oceanographic and Atmospheric Administration (NOAA), and the US National Climate Predictions & Projections (NCPP) Platform aligned well with our own project aim: the NCPP’s mission is to “support the collaborative development of climate information for adaptation by a community of climate scientists.” They aim to do this by developing their own climate data products and provide tools and metadata to assist users in their decision making. We have had several teleconferences during this last year about how CHARMe can be integrated with their efforts and to keep each other up to date on progress so far. 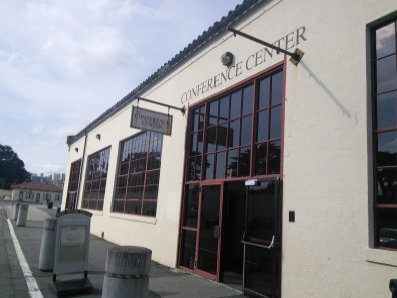 Raquel Alegre (University of Reading) was lucky enough to be offered the opportunity to travel to the US after learning about a few events relevant to the project located near NOAA’s premises in Boulder (Colorado). 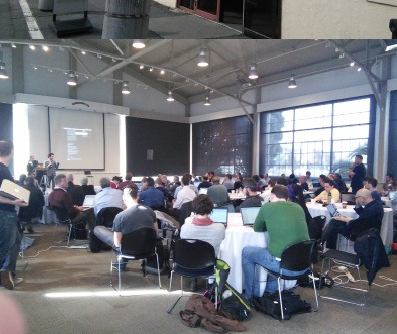 There was a workshop by W3C on Open Annotation (the standard chosen to represent CHARMe’s data model), a conference on state-of-the-art use of annotations, and a 48-hour hackathon on annotation systems with the participants of the workshop and the conference. 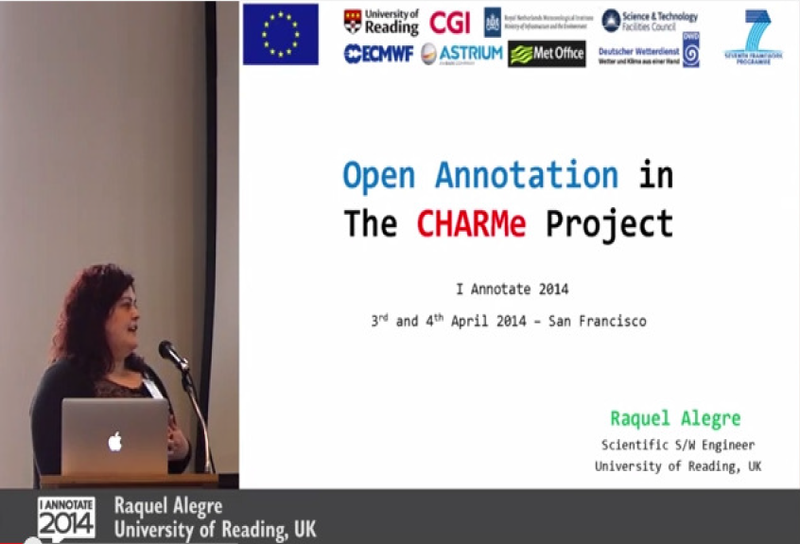 This gave a great opportunity to present the current status of CHARMe and future development ideas to the authors of the W3C Open Annotation (OA) data model. 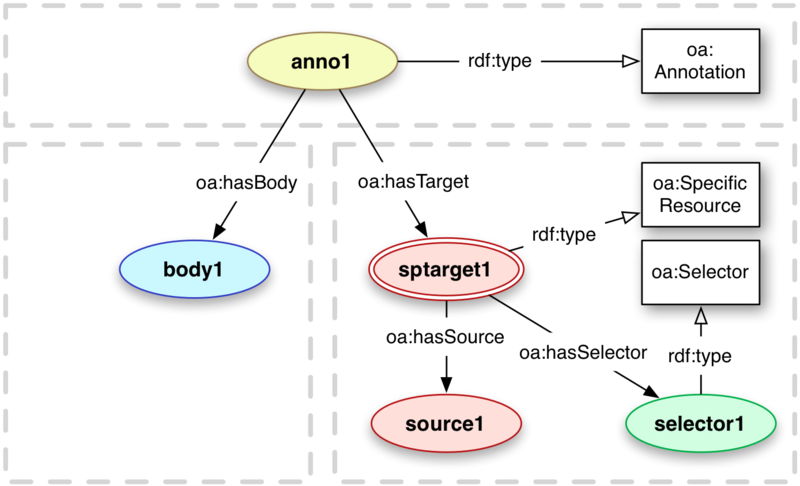 The CHARMe project is developing solutions for the annotation of temporal and fine-grained data, which has not been tackled by OA as of yet. After the conferences, Raquel attended a two day meeting with the NCPP group. On the first day she had the pleasure of putting familiar names to faces from the previous teleconferences. They were extremely enthusiastic and very interested in installing the CHARMe Plugin in their climate data service site, which is part of the CoG system, and gave very valuable suggestions for the advanced tools. All in all it was a great trip and an excellent opportunity to share knowledge and build partnerships with parties across the pond in the US.